For the last five years and more, Star War: The Old Republic told the story of Tenebrae, a Sith of humble origins who rose to great power and ultimately corruption. Of course, there were other great stories along the way — the eight player stories, and ultimately, the Outlander’s story — but even the story of Revan revolved around this hidden but powerful figure who was eventually unveiled as the Sith Emperor. At the end of last year, I talked to Producer Ben Irving and Creative Director Charles Boyd about the past five years of SWTOR and about what the future holds for the game. It turned out to be a wonderful, frank interview. I learned many things that I didn’t know about Irving and his introduction to BioWare, which I mentioned a post last year. 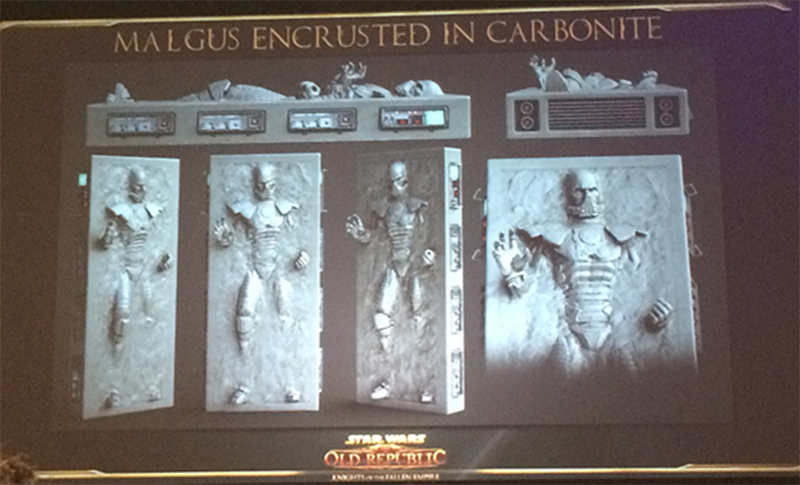 But I also learned some fun facts about the future of the SWTOR story. To understand what’s happening here, we have to go back over 13 years. Of course, we don’t know whether any part of the character of Tenebrae was fleshed out when Knights of the Old Republic was created, but we do know that if that game had not been successful, we would not have seen this character come to life the way we did. As I mentioned, the eight original class stories did center on your character, but the catalyst for the game was the invasion of the Sith Empire into Republic territory, which was spearheaded by the character we knew as the Sith Emperor but would later find out was a Sith from Nathema named Tenebrae. We discovered through the Revan novel by Drew Karpyshyn that Tenebrae was the individual who transformed Darth Revan and Darth Malak from curious and powerful Jedi to Sith mad with power. We also know that he was the savior of the Sith Empire after its defeat during the Great Hyperspace War. 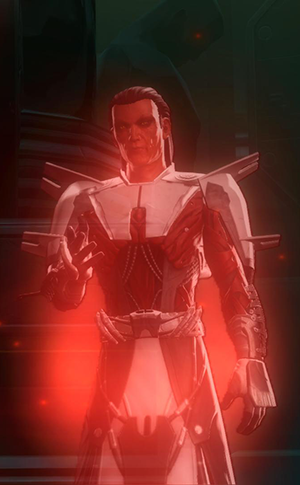 In many ways, Tenebrae has been the main villain for all the BioWare Star Wars stories. Boyd said Tenebrae “casts a long shadow.” But after 13 years of video games, comic books, and novelizations, his story has finally come to an end. Does this also spell the close of SWTOR? Boyd assured me that it most certainly does not. He even explained that this was one of the major struggles that he and his writing team had to deal with. Which door will the writing team take? With the closing of Tenebrae’s chapter will come the opening of a brand-new chapter. Of course, the BioWare team is content in letting the players and fans speculate where the story might go after this until it is ready to talk specifics about the future of the game — but now we know where to focus that speculation. I love the speculation game. It gets me in trouble sometimes, but it’s fun nonetheless. And Boyd really gave us only one clue to speculate on. He said, “I’m really excited at the thought of [moving forward with the story], seeing what we can do to keep that interest alive, and [giving] our players a new adversary.” The speculator in me ran wild at the possibilities. Other than the info we might hear about the direction they are going in a couple of months, no other specific details were given. But he might have given clues earlier in the interview. Of course, I will be paying close attention to the upcoming announcements, but what would these options me for the player? If we look at the story now, we see many possibilities, but are they compelling or interesting? The idea of bringing someone back holds some potential. Remember the deleted Darth Malgus scene from Knights of the Fallen Empire trailer? Perhaps we will see him return as a villain again. It might make my Malgus statue worth something once more. I’m not a fan of introducing someone new because the set-up time would take far too long, and there is a huge potential that it just will not work for the SWTOR audience. That said, it’s possible to introduce someone new only to find out that it’s really someone old could be interesting, but the trope is so common now that it’s a total cliche. No, the most interesting angle would be taking someone we know as a character and turning him or her into a villain. We sort of saw that done with Saresh, but she was never a character we were close to. If we were to turn a friend or companion into a villain, that would make things more than interesting. I want to give my utmost thanks to Charles Boyd for talking to me. And now, I turn this over to you now, Massively OP readers. How do you think Boyd and his team will keep things alive? Which way that he mentioned would be your favorite? Let me know in the comments below.